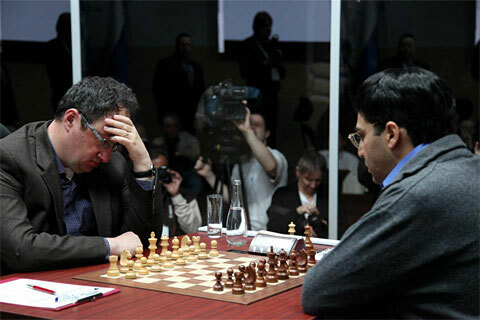 The chess move surprise that Boris Gelfand had prepared for Viswanathan Anand in Game 10 got a reply in the form of another surprise chess move from the reigning world chess champion in Game 11. Anand chose the Nimzo-Indian Defence for Black (like in Game 9) and left his opponent thinking very, very long after 8…Bd7. 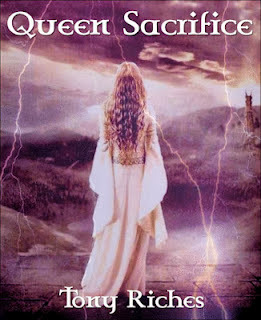 Eventually, of course, the Queens were traded and though Boris Gelfand held the advantage of two bishops, the “hanging pawns” in the centre came under fire from enemy rooks. 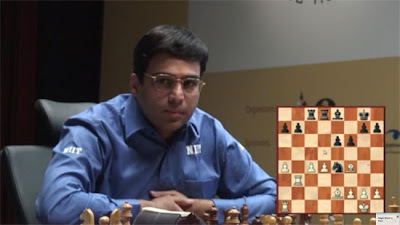 On the twentieth move, the Indian grandmaster launched tactical operations in the centre, preventing his opponent from stabilising the situation and strengthening his advantage. 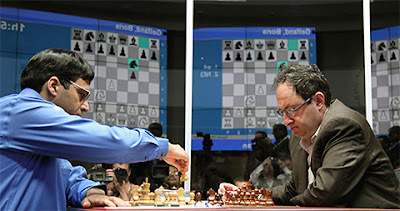 Running out of time to think, Gelfand decided to simplify things after which their positions were completely equalised. On the 24th move, the opponents agreed to a draw. The guests of honour on May 26 were the famous Russian musicians, pianist Nikolai Lugansky and cellist Alexander Knyazev. Former world chess champion Vladimir Kramnik delivered a lecture to children and parents and also took numerous questions from the young audience. 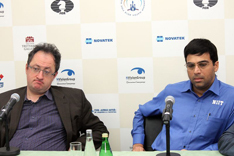 The world's second highest rated chess grandmaster Levon Aronian also visited the venue briefly. Following Game 11, the score is even at 5.5-5.5. Sunday, May 27, is an off-day at the match. Game 12 - the final one with classical time control - will be held on Monday, May 28. 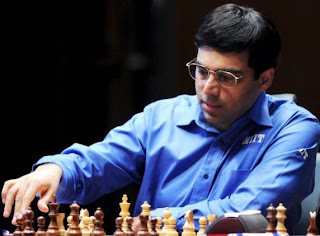 Viswanathan Anand will play White. If the score is still even after this game, the world champion will be determined by a tiebreak (in games with accelerated time control) on Wednesday, May 30. 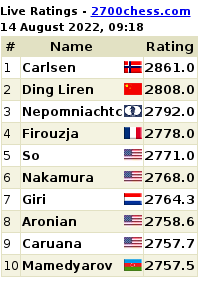 As always, you can watch the excellent live broadcast of Game 12 of the 2012 World Chess Championship at the official website. 2012 Anand, Gelfand World Chess Championship Game 11 in Moscow: Saturday chess did not have the fireworks expected. 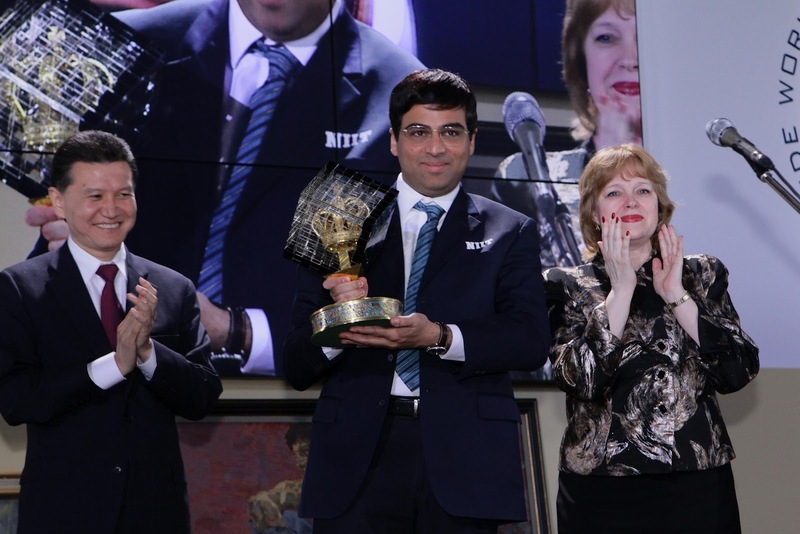 Reigning world chess champion India's Viswanathan Anand has settled into his rhythm and obtained an easy draw against Israel's Boris Gelfand in the game. 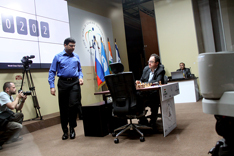 The Game 12 - the final in the series of classical control chess games in the current world chess match - would be played on Monday and would be available live through the fantastic official website feed from India time 4.15 pm. Meanwhile, here are the Game 11 moves in our Chess King applet. The crucial Game 11 is on today! 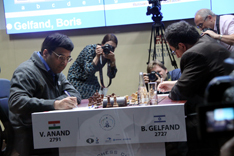 Tune in to the live webcast from the 2012 Anand, Gelfand World Chess Championship via the official website at about India time 4.15 pm. 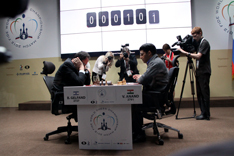 Only two games in classical time control are left in the main match. If the score remains tied after Monday's game, a tiebreak would be played on Wednesday. There is a rest day on Sunday tomorrow. Game 10 underway on Thursday. Photos: Official Website. 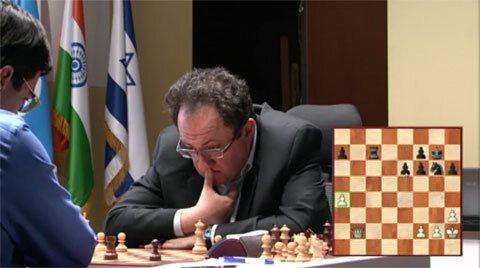 Israel's Boris Gelfand, the challenger would use his White to the best advantage. The risk is great. 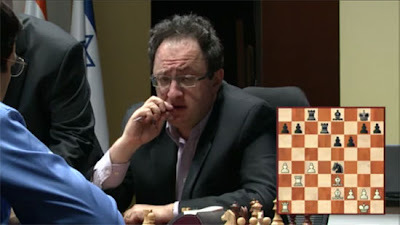 Gelfand has been on the offensive and he would like to decide matters for once and all. 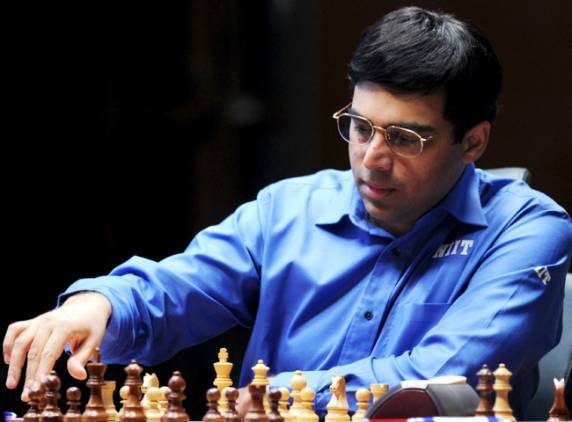 India's Vishy Anand has regained his rhythm. 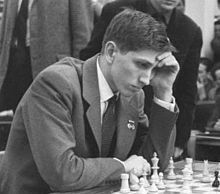 He has immense patience which he displayed in Game 9 by building an unbreakable fortress and letting Gelfand hammer at iron falls with no use. 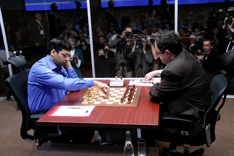 Most people think it is to Vishy's advantage if the match goes into tiebreak. However, Gelfand has come this far by getting through a series of tiebreaks against some of the current top players in the world. We think, the tiebreak could be an advantage for Boris Gelfand. Though, a tiebreak in a match like this is almost a lottery. A win by either player today could decide the match. 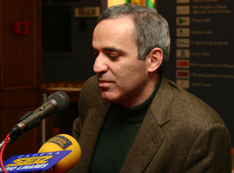 The World Chess Championship 2012 is down to the last two games between Israel's Boris Gelfand and India's Viswanathan Anand. The two remaining chess games - before the tiebreak (if required) on Wednesday - would be broadcast live at the official website on Saturday and Monday from 4.15 pm India time. Sunday is a rest day. The score stands tied at 5-5 as of now. Meanwhile, during the press conference after Game 10, it became known that the challenger had offered a draw on move 21, but the world champion decided to continue the game, believing that he still had winning chances after 14.Nbd2. Yet the game ended in a draw a few moves later. Asked whether the players analysed the games after they were over, the world champion answered that, of course, he was curious about what had happened but he didn’t spend too much time on analysis because he had to get ready for the next games. “I decided to postpone the analysis until after the match, when I’ll take a close look at my games,” said the challenger. 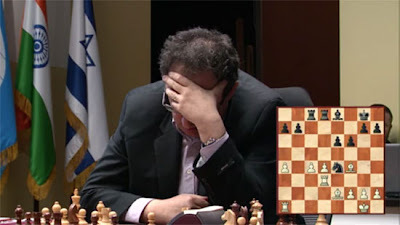 All credit to Israel's Boris Gelfand the challenger - for holding down India's reigning world chess champion Viswanathan Anand in the tenth game today at the 2012 World Chess Championship. If Vishy had prepared a surprise by going 1.e4 and went for a Rossolimo Sicilian (3.Bb5), then Gelfand returned the favour by playing5....e5. There are only two games left now and then a tiebreak would be played on Wednesday (if required). If the score remains tied at 6-6 by Sunday, a rapid/blitz tiebreak will be played on Wednesday. Do tune in to the official website of the tournament on Saturday for Game 11 live broadcast (India time 4.15 pm). 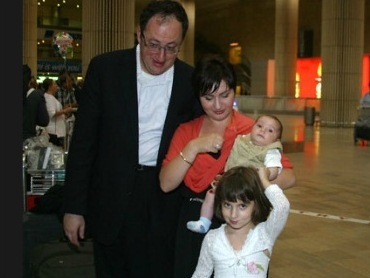 Boris Gelfand will have his last White on Saturday. Today Edvard Radzinsky, the famous writer, historian and TV presenter, was the honorary guest of the match. The press conference was dedicated to the “Chess and Terror” theme. Radzinsky spoke about the unique chess set titled “Reformers Against Revolutioners”, which was created in commemoration of the tragic events of the second half of the XIX century, when tsar Alexander II was murdered by members of the People’s Freedom movement. Radzinsly dwelled not only on the chess set, which was a genuine masterpiece, but also on the controversial era in Russian history, when the government of Alexander II implemented radical reforms in the country’s economic and political system. Three simuls were played in the chess courtyard. 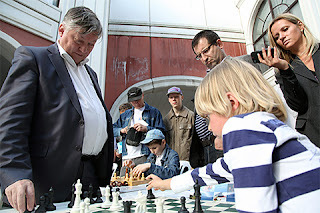 The 12th World Champion Anatoly Karpov, the Champion of Europe 2011 Vladimir Potkin and Grandmaster Vladimir Belov played against children. 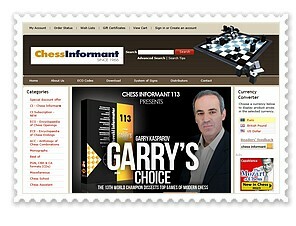 Meanwhile, you can view the 2012 Anand-Gelfand World Chess Championship Game 10 moves in our Chess King applet. 3-Gelfand's fear of a loss is gone!!! He knows the whiff of victory. Not as impossible as everyone said. 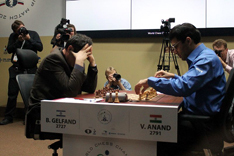 5-Gelfand's victory over Anand in Game 8 was more to do with his hold over the game as compared to Anand's victory in Game 9 that was more to do with Gelfand's blunder. B&W wishes both the players and all chess players a great Anand, Gelfand Game 9 at the 2012 World Chess Championship 2012 today available live at the official website.